They have totally incompatible chemistries, lol. Remember the pic where I found one of these in a floor lamp? This time, I found a blown one. Looks like an antique store from the fuzzy background. Ohh boy. Could you snag a few and incorporate them into the pile of stuff you've had set aside for me? Ouch... I'm very lucky this didn't happen to my Philips Lifeguard lamp after an electrician who came into my apartment to fix an outlet while I was gone took it upon himself to screw it directly into my ceiling light..!! Was that the 50w one? Apparently those have a lower arc voltage than the other mv lamps. Definitely lucky. Yeah. Thank god it's particularly stubborn to strike on 120V. This is the local ReStore near where I live. OK, I wonder if someone did once have a legit remote-ballast setup though? Yeah, a few members here did I believe. Ouch! My Powerlite mini gumball is actually wired with a cord and plug which is plugged into a remote CMH ballast. Does not surprise me that an electrician would take it upon himself to put a mercury lamp into a socket without gear...many are just "cowboys" with a licence in their back pocket. 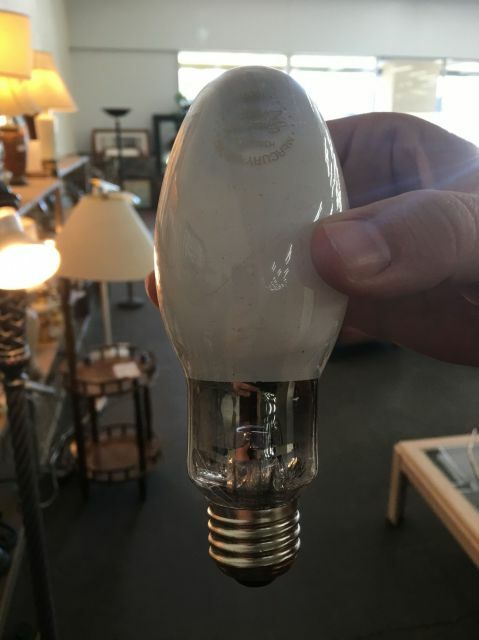 ReStore clerks often insisted they test the bulbs before I buy them. Including HID. I told them otherwise. When I was in Viert Nam I went into a lamp shop in Yersin Sreet, Saigon...and the fired up a Philips HPM-15 Gallium-Lead UVB lamp, right in the middle of the shop, there were glass cabinets down one side reflecting it everywhere...I just turned the power off at the switchboard to prevent everybody in there getting fried....he got real shirty when I did that!